Mother of Thousands (bryophyllum daigremontianum) is a beautiful and interesting house plant, and one of my favorites. 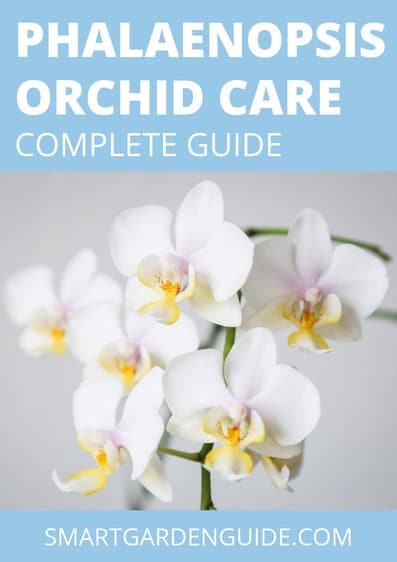 If you have one of these plants in your home, you’ll want to know how to care for it, so it thrives for years to come. In this guide I’ll cover everything you need to know about caring for your Mother of Thousands. But first, a quick summary of mother of thousands plant care. How to care for mother of thousands: Mother of Thousands should be planted in a well draining potting mix, watered infrequently but thoroughly, and kept in bright, indirect sunlight with low humidity at 65 to 75° F. The tiny plantlets that grow along the edges of the leaves will need to be managed as they try to take root wherever they happen to land. What Is A Mother Of Thousands Plant? Mother of Thousands is known by numerous other names – Mexican Hat Plant, Alligator Plant, and Devil’s Backbone. A native of Madagascar, the plant is a succulent that grows up from one stem. The large blue-green leaves are pointed and narrow and grow up to 6-inches long and 3-inches wide. The plant itself can grow as tall as 18 to 35-inches if you let it. 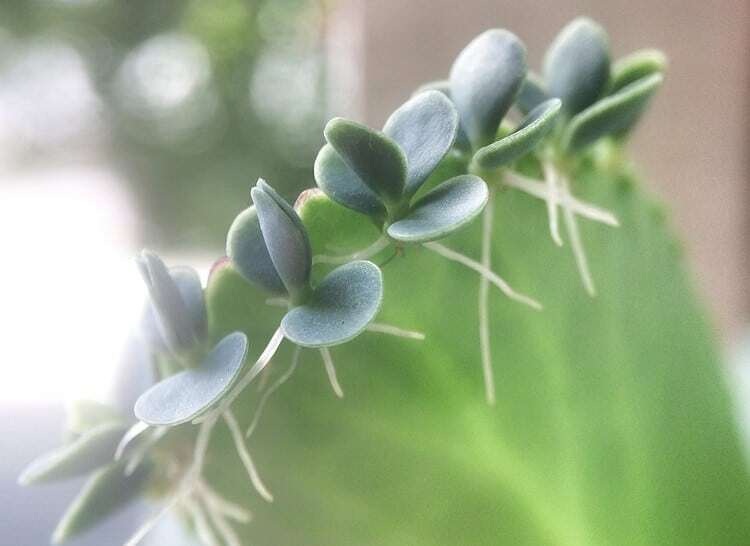 The most unique part of this plant is the tiny plantlets that grow along the edges of the leaves. These little plantlets will drop easily from the main plant, trying to take root wherever they land and find soil appropriate for growth. For this reason, many gardeners think of the Mother of Thousands as a bit of a problem plant, with the little plantlets doing their best to grow and multiply in all types of soil alongside other plants. You can easily see how the plant got its most common name – it’s the mother to thousands of other plants! When you’re growing Mother of Thousands indoors, you won’t have to worry too much about it propagating, although you may find that the little plantlets drop into any nearby plant pots where they can take root. Your Mother of Thousands needs plenty of light. In the hotter months, place the plant in indirect sunlight, otherwise its delicate leaves can easily be sunburned. In the cooler months from fall until early spring, when the sun isn’t as hot, you can place the plant in direct sunlight, so it gets enough light each day. If you have an east facing window, your Mother of Thousands will thrive there. They love the direct sun in the morning, when even in the summer the sun isn’t yet that hot. North facing windows are often a poor choice of the Mother of Thousands – there won’t be enough hours of light for the plant when facing in this direction, even in summer months. 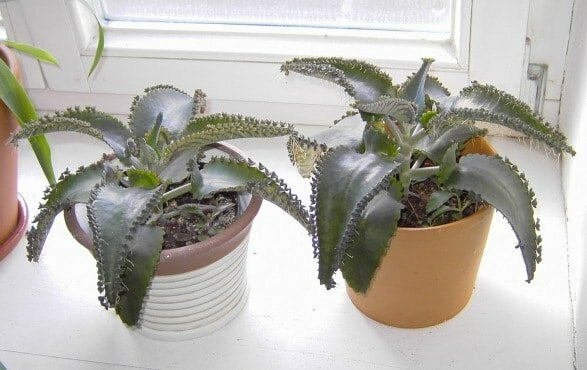 Keep in mind that from early June until late September, south and west facing windows will provide too much heat for your Mother of Thousands – consider finding another location for the plant in your home during the summer months. 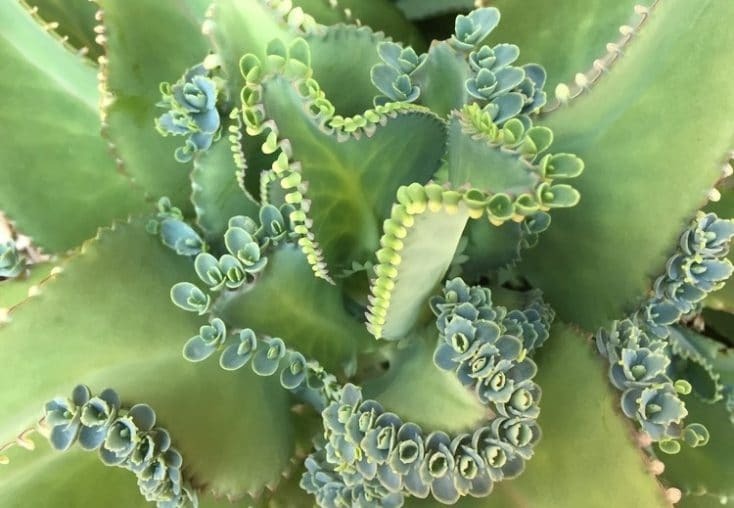 You’ll know when your Mother of Thousands is getting just the right amount of light – the leaves will be a vivid green and have a beautiful outline of red to them. When the plant isn’t getting enough light, it can become spindly and tall, shooting up in height. There will be large spaces between the leaves, making the plant look a little sparse and worse for wear. If possible, Mother of Thousands does best in temperatures of 65 to 75° Fahrenheit (16 to 24° Celsius). During the colder months, when you’re heating your home, keep the plant away from direct heat. Not only can the direct heat damage the leaves, it can dry the plant out too fast. What’s The Best Pot For Growth And Drainage? The roots of your Mother of Thousands are quite delicate and do best when air can circulate around them. The best choice is a terracotta pot that has holes at the bottom so that any excess water can easily drain out. You can improve the drainage system even more by putting some pebbles or a few small stones at the bottom of the pot. Place the pot into a tray so the excess water can drain out – then make sure to empty the tray when water starts to collect.The plant doesn’t do well in soggy or damp conditions. If you let the Mother of Thousands stand in water, the roots may start to rot, causing damage to the plant. Your Mother of Thousands likes to be planted in small pots. The larger the pot is, the bigger the leaves will grow and the taller the plant will get to be. For bushier plants, stick to planting each Mother of Thousands in a smaller pot, changing size as the plant gets bigger. These plants aren’t always good at sharing space in pots with other plants – their little plantlets can quickly take over. Even if there’s enough room in the pot, avoid planting Mother of Thousands with a buddy plant. Otherwise you may find the Mother of Thousands taking over and the buddy plant isn’t able to thrive. What Soil Is Best For Mother Of Thousands? The Mother of Thousands does best in sandy soil that drains well. A potting mix designed for cacti is a good choice. If you don’t have a sandy potting soil, you can make your own. Just add some course sand to regular potting soil. Perlite – Perlite is crushed volcanic glass that is added to potting soil to keep it light and loose. Pumice – Pumice rock helps to aerate the soil and keep it loose, so water drains well. Vermiculite – Made from mica, vermiculite helps to retain some moisture in the soil while still allowing for good aeration. Avoid using soil that has a mix of peat moss, humus, or loam. With any of these in the potting mix the soil will take too long to dry out, keeping too much moisture in the pot. Water the soil of your Mother of Thousands thoroughly. Before watering again let the plant dry out so that the top 2-inches of soil are completely dry. When watering, always use water that is room temperature. The roots of the plant are extremely sensitive to temperature. Using water that is too cold or too hot can “shock” the roots and cause damage. Another tip for watering your Mother of Thousands: water the soil only and avoid getting water on the leaves. The leaves of the plant are prone to rot when they get wet. During the colder winter months, you can water the Mother of Thousands less frequently, providing just enough water so that the soil stays moist without becoming saturated. Don’t let the plant dry out completely, otherwise you may dry it out to the point where it can’t be rejuvenated! Like any other house plants, your Mother of Thousands may need to be trimmed back now and then. If the plant starts to be wiry and spindly, pinch off the top of the plant directly above a large leaf. This will prompt the plant to start growing leaves further down on the stem. With all the little plantlets, your Mother of Thousands is an easy houseplant to propagate. The first thing to do is pick two or three of the plantlets from one of the leaves. If you’re not going to plant them right away, place the plantlets into a plastic bag or seal in plastic wrap. You want to keep them moist until you’re ready to use them. Take a small terracotta pot and add cactus soil. Don’t worry about finding a deep or big pot – the roots of the plantlets will take some time to grow big enough for a large pot. Put the plantlets directly onto the soil, making sure they’re at least a ½-inch apart. Spray the soil and the plantlets with water so they’re moist without being saturated. Then cover the pot with plastic wrap so that you’re creating your own little greenhouse. Place the pot where it gets a lot of sun – then continue to keep the soil and plantlets moist, being careful not to overwater. If you give them too much water, they have a tendency to rot, making them unusable. Mother of Thousands doesn’t like a lot of humidity – this goes for the plantlets as well. Keep an eye on the plantlets, watching as they start to grow. Adjust the plastic wrap so that it doesn’t crush the plants. You can place a toothpick in the soil and tent over the plastic wrap. When they’re about an inch tall you can remove the plastic wrap, keeping them in the sun as they continue to grow. If you have a really green thumb, some of these new plants may flower for you, bursting with little pink/purple flowers. When the plants are big enough you can separate them and plant them in their own pot. Keep in mind that the roots of these new plants are very tender and can be easily damaged. Make a wide cut into the soil when transplanting them to avoid making any cuts into the roots. When and How Should You Repot? When your Mother of Thousands becomes too big for the pot it’s in, you can repot to a bigger size. You’ll easily be able to tell if the plant needs more room to grow. The roots will become pot bound or they’ll start to grow out through the drainage holes at the bottom of the pot. Plants that are too big for the pot they’re in will also start to dry out faster, even in cooler temperatures. Still another sign that your Mother of Thousands has outgrown the pot is if the leaves and stem have stopped growing or slowed down considerably. Wait until the spring before transplanting to the larger pot. Spring is the ideal time – the increased daylight hours and the warmer temperatures will fuel the growth of the repotted roots. Choose a new pot that’s the next size up from the one the plant is currently in. A good rule of thumb is to choose a pot that has a height and diameter about 2-inches more than the current pot. Make sure the new pot also has sufficient drainage holes. Your Mother of Thousands will eventually grow into any pot size, but in the meantime, it will look unbalanced in pots that are too big. When you’re ready to repot, fill the new pot one-third full of soil. Use cactus potting soil, or make your own mix of sandy soil, as I mentioned earlier. Tamp down the soil so that it settles a bit. Take your Mother of Thousands and put your palm down on the soil, spreading your fingers around the stem of the plant. Then turn the pot upside down, gently squeezing the sides of the pot so that it’s loosened from the roots. Carefully slide the plant out of the pot. Remove any roots that are broken or that look dead. Also, trim back any roots that look mushy and rotted. Be very careful when handling the tender roots so you don’t break any of the healthy ones. If there are any long roots, you may have to trim them back, so they’ll fit into the new pot. Carefully place your Mother of Thousands into the middle of the new pot, positioning the top of the roots about 1-inch below the top of the pot. Add about 2 to 3-inches of soil. Tamp down the soil to compact it a bit. Don’t fill the pot with too much soil. Water slowly with room temperature water, giving the soil time to absorb the water. Water a couple more times to make sure the soil is evenly moist. Let the excess water drain out of the bottom of the pot. And you’re done! Your Mother of Thousands will be happy to have more room to grow and thrive. Does Mother Of Thousands Flower? When grown indoors as a house plant, the Mother of Thousands rarely flowers. When grown outside and kept in the garden, Mother of Thousands will flower if the conditions are right. The flowers are pink and tubular in shape, hanging gently over the main stalk of the plant. They only bloom on plants that are mature and then only in the late fall and early winter if the temperature isn’t too cold. After blooming the plant dies, leaving behind its many plantlets to start sprouting in its place. Terrariums are very popular – they’re a great way to grow and display cacti and succulents. Mother of Thousands is a good plant choice for terrariums. As a succulent that prefers lots of indirect sunlight, Mother of Thousands can be grown very successfully in a terrarium or glass container. However, it’s important to remember that this plant may be quite invasive when grown with other plants in the terrarium – when the small plantlets fall and take root, they can quickly take over. You can control this by removing the plantlets from the terrarium before they root. This leaves only the main Mother of Thousands plant, which can look quite lovely in a glass container with its interesting leaves. 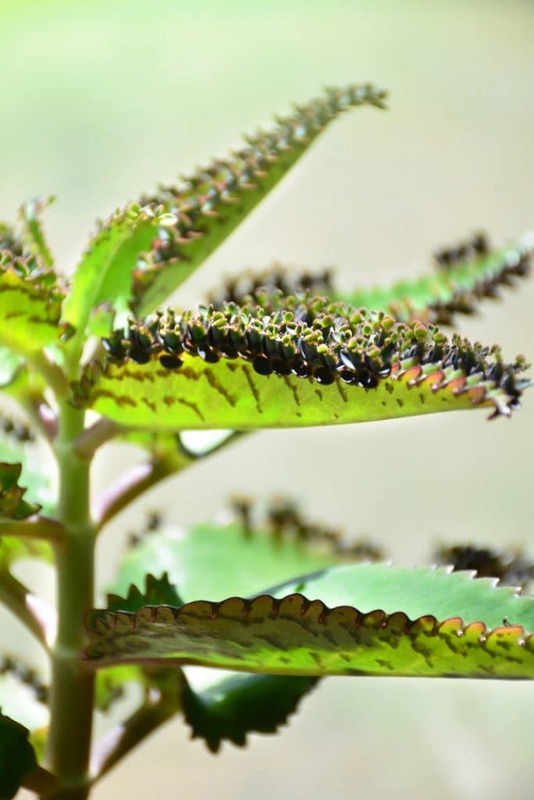 Is The Mother Of Thousands Plant Poisonous? Mother of Thousands is a poisonous plant. The leaves, stem, and tiny plantlets are all toxic and could be fatal to small children and pets. If you have children and pets, be sure to keep the plant well out of reach. Should I Pinch Off Dead Leaves? The plant will typically prune itself if there’s damage to a leaf or if it becomes too dry. Go ahead and pinch off any dead and damaged leaves. Your plant will look healthier when these dead leaves are removed. Should I Fertilize My Mother Of Thousands? Fertilize the plant every three months, but only from March to September. During the fall and winter Mother of Thousands won’t grow as much so no fertilizer is necessary. Use a well balanced liquid fertilizer that’s been diluted by half. Why Are My Mother Of Thousands Leaves Curling? There are two reasons the leaves on your plant may be curling: 1) you’re overwatering, or 2) it’s not getting enough sunlight. Try giving it a bit less water and move it to a location in your home where it will get more hours of sunlight each day. If I prune my plant like you described can I then plant the top I pinched off? Thanks for commenting. You certainly can propagate the top of the plant that you pinch off. Cut the stem cleanly, let it dry out for 2-3 days, then plant it directly in a pre-prepared pot and there is a very good chance it will develop roots. Of course, with the little plantlets growing so readily along the leaf edges, you are often better to propagate using these as they root and thrive so easily.